Note: The following is a true story. The names have been changed to protect the innocent. So, I was working at the Goodman, when my stage manager, Joe, told me about something he saw while riding the train. He was waiting at the Howard 'L' stop, where the Purple and Red lines stop. 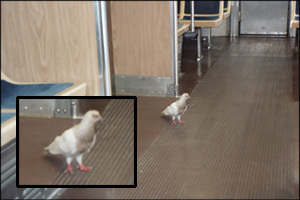 He claimed to have seen a pigeon hop on the Red line before the train left the station. After further inquiry, he discovered that as far as the legend goes, the pigeon does this every morning. He hops on the Red line at Howard, gets off at the next stop, then flies back and does it again. I feel a twinge of excitement, and I begin to follow the pigeon around. Sure enough, he hops onto the Red line, which is waiting to leave the station. I then notice a second pigeon on the train, which was quite unexpected. However, my hopes were temporarily dashed when a woman got on the train and, having no interest in sharing a train with a couple of pigeons, shooed them out of the car. Feeling slightly dejected, I too left the car to watch the pigeon's next move. I was a little worried I had missed my one opportunity to see the spectacle. Fortunately, all was not lost, for the pigeon wandered around on the platform for a few minutes, and waited for the next train. When the train arrived, the pigeon once again got one. The wannabe pigeon had been scared off by the woman, and had not returned. It was just me and the pigeon. The pigeon sizes up the car and makes sure it's fit for travelling. 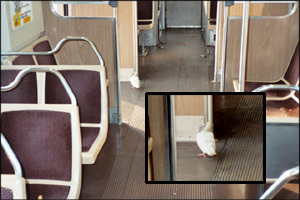 As the train closed it doors, the pigeon seemed eerily at ease. He wandered around the car, enjoying himself. Then, as the train came to the next stop, the pigeon did what any normal passenger would do: he walked up to the door and waited for them to open so he could leave. Yes, the pigeon walked up to the door and waited to get off. The doors opened, and he flew off, headed presumably back towards the Howard station. I just kind of sat there, a little dumbstruck at what I had just seen. The story was true. The pigeon takes the train, every morning, one stop, then flies back up and does it again. But why? What is the pigeon's motivation behind it all? 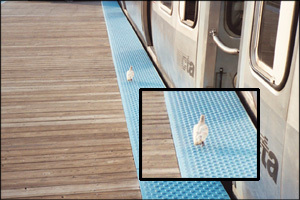 Was a former CTA rider born again as this pigeon, destined to ride the train every morning, to remind himself of his previous travel schedule? No one will ever know. If you think this is all made up, I recommend you head out to the Howard stop one morning, around 7:30, and look for a pigeon heading southbound on the Red line. Then you too can be witness to the spectacle.